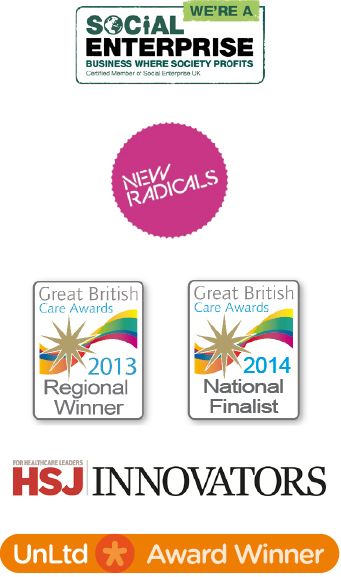 12:56 pmShould a care home choose Remember-I'm-Me Care Charts or Mycarematters? 12:56 pmWhat causes that frightening world of hallucinations? 12:56 pmHow difficult can it be to draw a star? We continue to add books to this section on a regular basis. 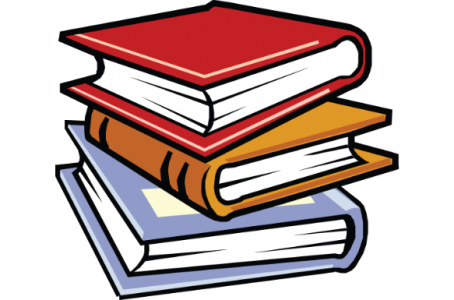 If there is a particular book you would like to see included, let us know at feedback@carechartsuk.co.uk. Professor Stokes has often had to look deep into peoples’ pasts to find the clues to their current behaviour, behaviour that may have been causing significant distress to themselves and those around them. Within each of these eighteen stories there are valuable insights wrapped in humanity: Cathy and Jimmy for example, teach us that good care is not measured by flawless appearances, we learn from Maria to be alert to the potential risks of reminiscence therapy, from Gillian and Spencer that dementia has no bearing on our need for closeness, touch and affection, and from Suzy to check the bus timetable before attempting to impose culture change in a care home. 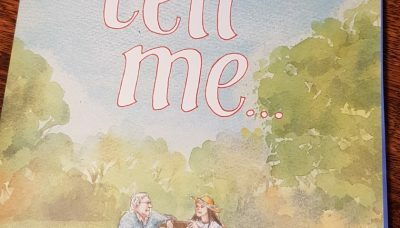 This book has something to say to anyone with even the loosest connections to dementia, and that, after all, is most of us. Be prepared to shed tears. 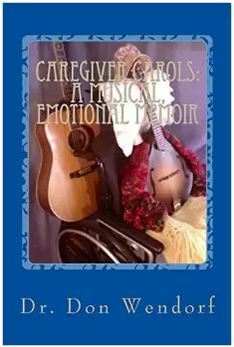 Published by and available from Hawker Publications Ltd.
Dr Wendorf brings his combined experiences of phsychologist and psychotherapist, musician and caregiver to his wife of 40 years in this moving, informative, creative and practical memoir. Searingly honest at times, the author is prepared to tackle the toughest aspects of being a caregiver: guilt (a ‘good, normal, healthy emotion’), the ongoing sense of bereavement (‘I’ve been in denial about being in mourning’), how to accept help (‘don’t deny other loving people the blessing of being able to serve, comfort, support, help, care for, love and give to you’) and perhaps the toughest one of all, the impact illness can have on a couple’s intimate relationship. The author blends a mix of song lyric rhyming verses with accompanying prose commentaries to make it easier, more effective and more memorable to get his messages across than the ‘standard didactic approach’. In describing his own emotional struggles as a caregiver, Dr Wendorf hopes to encourage other caregivers that their own feelings are tough but normal and manageable and that they are not alone. 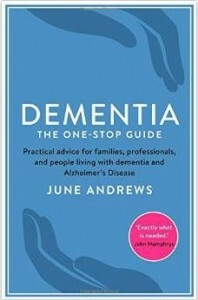 I’ve had the privilege of hearing Professor June Andrews present at a number of conferences and have always enjoyed her unique mix of down-to-earth practical approach to dementia care and refreshing sense of humour, so I was delighted to see the same attributes appear on the pages of this invaluable book. Advertised as ‘practical advice for families, professionals, and people living with dementia and Alzheimer’s Disease’, one might think it a little ambitious, attempting to be all things to all people, but I would defy anyone in those groups mentioned to read it and say they learned nothing. No subject is taboo, there’s lots of myth-busting and advice on how to negotiate a system which, the author acknowledges, all too often lets people down, plus comments from carers, professionals and those living with varying forms of dementia. 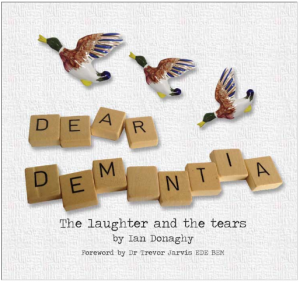 If you’re looking for a jargon-free easy read, packed with practical information for anyone dealing with dementia in the UK and flashes of good humour to lighten the message, this is the book for you. Journalist Greg O’Brien writes powerfully about his ten year journey – so far – with Alzheimer’s. 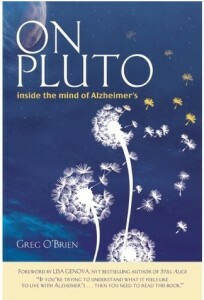 There are a number of laugh out loud moments as he paints a vivid picture of his daily struggles to find coping mechanisms and strategies to circumvent the disease that is determined to trip him up, and which will, he knows, eventually send him to Pluto, his allegory for the end stages of Alzheimer’s Disease. On every page O’Brien demonstrates how he is living with dementia, not dying from it. “Like dipping into a basin of water, and trying to hold the droplets in your hands as you splash your face with pure joy”. So says the late Lynda Bellingham in her resounding endorsement of this wonderful anthology of poems and words, collected from people living with dementia. 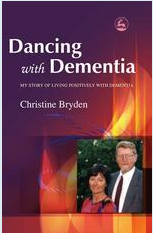 Author Christine Bryden continues to lead an active life and in May 2015 it will be an incredible 20 years since her diagnosis of dementia. Christine was a top civil servant and single mother of three children when she received her diagnosis at the age of 46. 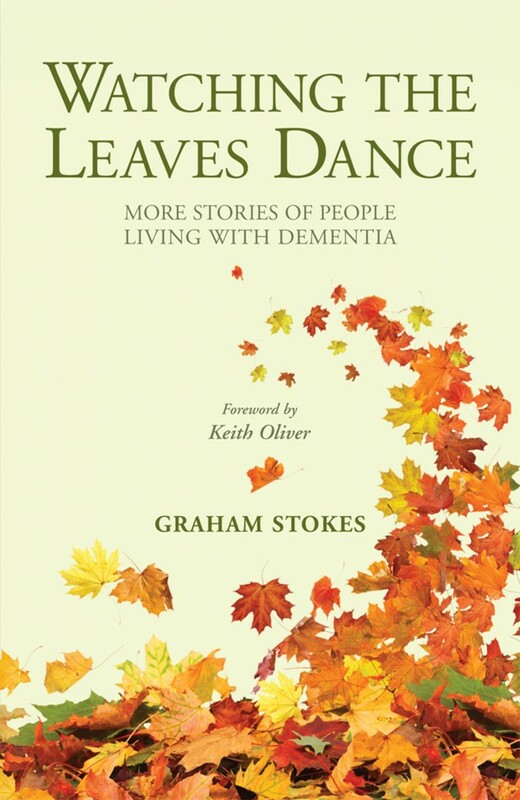 ‘Dancing with Dementia’ is a vivid account of how she dealt with that life-changing news, exploring the effects of memory problems, loss of independence, difficulties in communication and the exhaustion of coping with simple tasks. She describes how, with the support of her husband Paul, she continues to lead an active life despite her dementia and explains how professionals and carers can help. Click here for further information and ways to purchase. Person-centred Dementia Care. Making services Better. 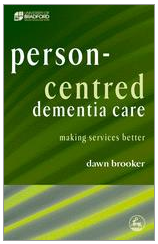 This was the first book I read about dementia care when my husband had to move to a care home in 2009 with advanced dementia and complex needs, and its value and relevance for anyone involved in providing care shone out immediately. Refreshingly honest and down-to-earth, Professor Brooker questions whether all providers who claim to offer person-centred care truly reflect the values that should lie behind this overused and misused term. 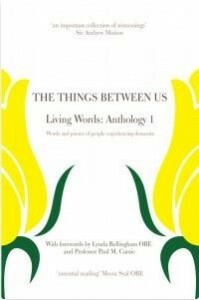 She describes her book as an attempt to articulate the different elements of person-centred care and to describe what these look like in practice. Frequently referring to Tom Kitwood as her inspiration, Dawn Brooker explains the four key elements of person centred care that comprise the VIPS model: Valuing people with dementia and those who care for them (V); treating people as Individuals (I); looking at the world from the Perspective of the person with dementia (P); and a positive Social environment in which the person living with dementia can experience relative well being (S). 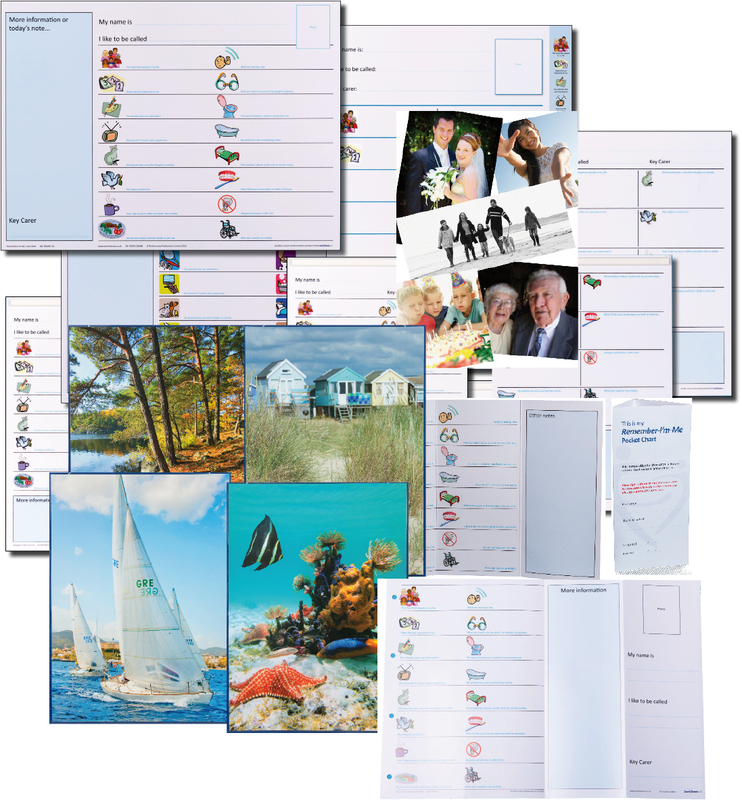 With an emphasis on practical application, Person Centred Dementia Care provides care organisations with clear, accessible guidelines on how to put the VIPS model into operation for effective care that is `fit for VIPs’. 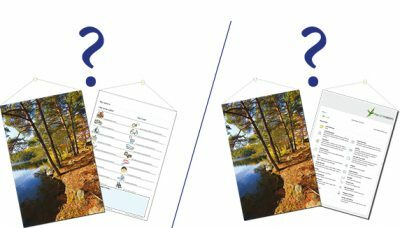 Part 2 of the book comprises the VIPS organisational reflection tool, which care providers can use to assess how well they think they are doing at providing person-centred care. Click here for further information and to purchase. Most people reading this will have heard of Dr Kate Granger, and of her struggle to live as normal a life as possible under the shadow of a terminal cancer diagnosis. As famous as the doctor herself is her inspirational ‘#HelloMyNameIs…’ campaign to encourage all health care staff to introduce themselves to their patients before delivering care. As Kate says on her website, introducing oneself is much more than just providing a name: it is making a human connection, beginning a therapeutic relationship, building trust. Kate’s first book, ‘The Other Side’ is riddled with technical terms and medical-speak, making it quite clear which audience she wants to reach. Self-published, with all profits going to the Yorkshire Cancer Centre and orders being handled by Kate and her husband Chris so as to maximise the revenue for YCC, it reflects very much the author as she describes herself: ‘slightly bossy, competent but compassionate’ and no sign of the person she fears some will see her as: ‘that poor girl dying of cancer’. For us lay people, Kate has thoughtfully provides a glossary of terms, but one doesn’t need to understand the jargon to get the message. This is a doctor telling it how it is on the other side. Or, to put it another way, this is a patient with medical knowledge describing the progression of her illness, details of her treatment, and making it quite clear what worked and what didn’t in the huge variety of approaches and attitudes she experienced from her professional colleagues. I read both books from cover to cover with barely a break, hauled in trepidation along Kate’s journey with a mixture of emotions, feeling her frustration when the medics got it wrong, delighting with her when she experienced compassionate, kind and intelligent care, reduced to tears when she, rarely, appears overwhelmed by pain and the desperate nature of her situation. Being able to return to work allowed Kate to put into practice the things she had learned as a patient: proper communication – finding the right balance to avoid being patronising or confusing; getting the little things right such as getting on the same level as your patient when talking to them; remembering that you are treating a human being and not just a medical condition. It is clear from reviews and from Kate’s own comments that doctors and other healthcare staff have also adjusted their behaviour as a result of reading Kate’s books. I’d say they need to be on the compulsory reading list of every single healthcare professional. This link will take you to Kate’s website where her books are available for purchase. Dr Graham Stokes has written a number of books on the subject of dementia care, but this is no ordinary instruction manual. 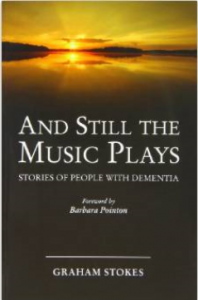 Instead, the author recounts 22 compelling stories of people with dementia and looks beyond the obvious in an attempt to explain why some behave in the way they do. You will read about Mr Abrahams who came alive when touched by human contact, how a window into Mrs S’s world opened when staff came to understand her aversion to shared toilets, and how Lucy’s quality of life was transformed when it was discovered what caused her to shout for hour after hour. 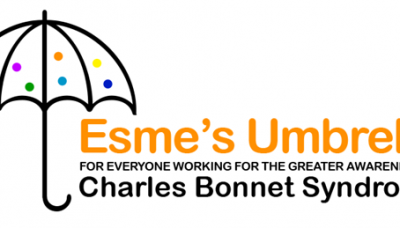 The central theme is that everyone is unique, and it is only by thinking deeply about each person individually that we can give the best possible care. As author Ian Donaghy says, “Dementia is an uninvited guest. It does not discriminate and is often merciless… but there is still laughter to be heard.” These short letters and over 100 illustrations, with their simple yet powerful messages, provide many opportunities for people to laugh and to cry, to learn and to ponder. They are based on Ian’s own experiences and conversations with people living with dementia and their friends and family, including children. This is a delightful book which has at its core a heartfelt plea that we focus on the person and not the dementia.